The Fourth of July weekend might be over, but Summer is just getting warmed up! 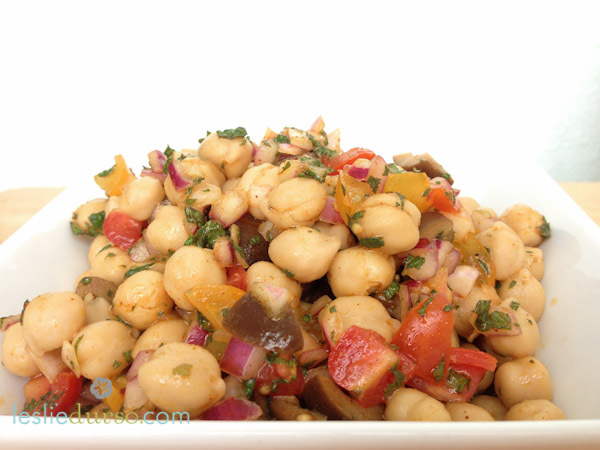 My Mediterranean Garbanzo Bean Salad recipe is the perfect make-ahead salad to bring to a party. The bright flavors of mint add something extra special to this hearty dish. Added health bonus: Garbanzo beans (also known as chickpeas) are low in fat and super high in protein, fiber, folate, and iron! In a mixing bowl, combine the onion, vinegar, salt, pepper, turmeric, chili powder, and paprika. Stir well. Add in the beans, olives, tomatoes, and mint. Taste. You may want to add more salt and pepper or even a dash of cayenne if you like it spicy. Chill. *Note: If you are making this dish ahead of time. Add the mint right before you are going to serve it. It can become bitter if left in overnight. *Note: Yes, you can use dried beans in this recipe. Just hydrate, cook, drain, and chill before using.